Letters, memos, e-mails, reports, court submissions, policies, procedures, publicity, devising standard letters and so on might take up to 50% of your time. Maybe even more. For many of us, all this writing can be a difficult, confusing and anxiety-filled task. More often than not, we're left to our own devices because, like everyone else, we're just expected to know how to write. This book is probably the help you have been crying out for. 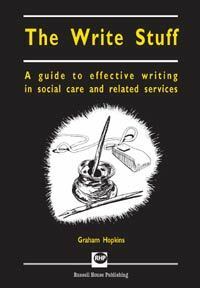 A good practice guide for writing effectively in today's social care and related services. The Write Stuff will show you how to plan, research, structure, write and edit your written work. 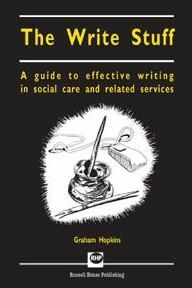 It draws on real examples to illustrate the principles of effective writing. It also, uniquely, creates a case study report that develops along with the book's chapters, showing how a report evolves from the planning stages to final publication. Graham Hopkins works independently, and was for seven year Head of Inspection in the London Borough of Barking and Dagenham. He is also author of the acclaimed Plain English for Social Services.